We would be happy to make a quilt for you from your T-shirt collection! 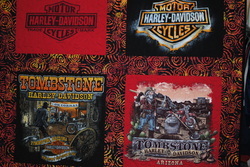 Do you have a collection of Harley-Davidson T-shirts? What about those school, church, or sport shirts? Are you wearing them? Are they taking up space? Why not turn them into something comfortable and useable that still reminds you of all those pleasant occasions? They make great gifts--to yourself or someone else. Graduation, off to college, birthday, Christmas, or for no occasion at all. Send your washed t-shirts (no fabric softener please) and we will do the rest! The result is a unique quilt. Once we receive the t-shirts and inspect them, we will contact you to discuss the design. The price includes stabilizing interfacing, fabric for sashings (strips of fabric between shirt blocks) and/or borders, batting, fabric for backing, thread, labor, and return shipping. You may choose your fabrics and colors or allow us to make that artistic decision for you. We use good quality cotton fabrics that are made specifically for quilts. If we are able to make your t-shirts fit into neat squares or rectangles, we'll do that. If it needs some customization (using all the parts of a t-shirt: front, back, sleeve, pocket requiring different size blocks), then we'll do that, too. Keep in mind that customization will cause the price to go up quite a bit because of all the extra design work (and math!). We will quilt your quilt with an overall stitched design. We may use a pre-designed pantograph pattern or a simple custom design (flames, meander, loops, hearts, words, filigree, or ???). The machines used to make your quilt are high quality and professional grade. The people who will make your quilt really enjoy doing this! We will listen to your requests and will work with you on your personalized quilt. Here is our introductory pricing: For a general idea, you can estimate the cost at $20 per t-shirt. However, due to the highly customized nature of this work, prices may vary significantly. We will discuss (either by telephone or email) all pricing details before we cut any of your t-shirts. Please contact us with questions at lucindasnicethings@gmail.com or by filling out the form below. We would love to make your quilt! Tell us about your t-shirts and any ideas you have!